For NSW businesses the Korea Australia Free Trade Agreement (KAFTA) is already paying dividends, just 18 months after it came into effect. NSW companies in the food and wine industries have led the way, demonstrating how to take advantage of the new export opportunities created thanks to tariff reductions. Under KAFTA, Korea will progressively eliminate its 22.5% tariff on sheep meat. 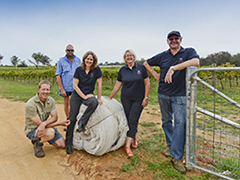 Junee Lamb, based in NSW’s Riverina region, is just one company reaping these benefits. It was after KAFTA was signed that Junee Lamb exhibited at the Seoul Food & Hotel Exhibition in May 2015, which was supported by the NSW Government. Off the back of the exhibition Junee Lamb has increased its business in Korea by 30%. The opportunities under KAFTA aren’t restricted to the food industry, with wine tariffs of 1% completely removed under the agreement. Shaw Vineyards, based in Murrumbateman in NSW’s Southern Tablelands, is part of the Canberra wine district. Shaw Vineyards showcased their wines at the NSW Government-supported booth for NSW wines at the Australian Wine Grand Tasting in Seoul in September 2015. As a result of the expo the vineyard is now working with C&V International, which exclusively distributes Shaw wines throughout South Korea. Graham Shaw of Shaw Vineyards acknowledges the removal of Korea’s wine tariff has greatly increased his ability to access the Korean market. Mr Shaw also says the increased awareness of Australian wine as a result of publicity around the KAFTA was just as helpful.